Can I change my oil and forget about it for a year? Normal Service – Up to 40,000 kilometres or one year, whichever comes first. Severe Service – Up to 24,000 kilometres or one year, whichever comes first. Here in Canada everyone is limited to the Severe Service schedule so that simplifies things even more. But knowing the service life of the product doesn’t mean you can simply forget about your oil or your vehicle until the mileage or the time expires. That is the same service interval as 4 “normal” oil changes! When you have to add washer fluid. When you rotate your tires and/or swap your winter tires on or off. If you didn’t use an AMSOIL EA Oil Filter you will need to change the filter during the service life according to the recommendations of the filter manufacturer (could be up to 4 filter changes!). I also strongly suggest that for the first time you decide to extend your oil change interval beyond the recommendations of your owners manual that you do one or both of these preparation steps for your vehicle. Use the AMSOIL Flush product to clean out old engines that have run on non-synthetic oil for 2 years or more. Shorten your first drain interval to half of the suggested interval – aka 6 months or 12,000km – for the first run of the AMSOIL signature series product of your choice. These preparation steps help your engine to clean up and allow you to verify the oil is performing as you expect. The final step is to put a fresh fill of AMSOIL Signature Series oil in and at about 1/2 to 3/4 of the oil service life do a used oil analysis to verify that the oil is still working properly and protecting your engine. This check is to gather information on how the engine is performing since the last oil change. It exposes any fuel or coolant dilution issues, checks for excessive wear metals and gives a reading of how much detergent remains available in the used oil to fight the acidity of combustion through the TBN number. After this final check returns satisfactory results now you can safely change your oil yearly without concern – but be sure to monitor the level of the oil throughout the year. Moderate oil consumption is normal for all engines – we just don’t notice it because we dump the oil in 3 months. If you notice a sharp drop in oil level have the vehicle inspected. This is how I suggest you introduce AMSOIL’s extended drain products to your vehicles. It is very conservative and allows you to prove to yourself the oil is working properly and is able to protect your engine. 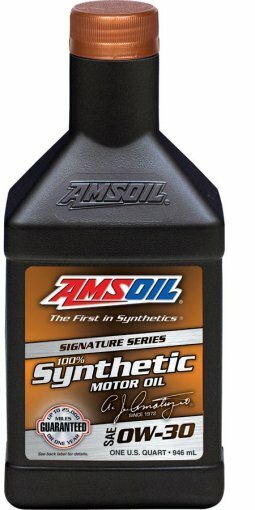 You could simply drop in a fill of AMSOIL Signature Series oils and drive for a year but that isn’t how I like to prove to customers that the product is capable of its claims. * AMSOIL only warranties their oil service life recommendations for unmodified engines that are mechanically sound with the proper level of oil installed.